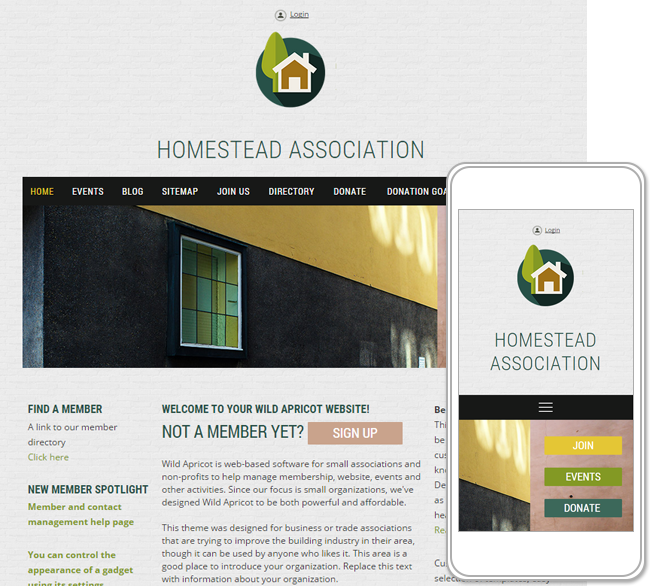 The Homestead theme set is part of a series of themes designed for business and trade associations. Though designed with home building and homeowner associations in mind, Homestead themes can be used by any type of organization, particularly if you want to take advantage of its responsiveness, its theme colors, or its theme-specific functionality (see below). By default, responsiveness is enabled in all Homestead themes. You can, however, disable the responsive behavior using theme overrides. A defining element of the Homestead theme set is its static background which does not move as your visitors scroll up and down the page. Some of the Homestead themes use a single large background image, while others use a repeated background pattern. You can change the site background from the Colors & styles screen. We recommend using backgrounds with neutral or watercolor palettes to complement the theme colors. The theme also features a sticky placeholder that you can use within a page template to create a non-scrolling area at the top of your page, perfect for sticky menus. Sticky placeholders are identified in Homestead themes by a HTML ID value of id_Header1, which you can view within the Advanced section of the placeholder settings. The typography of the Homestead theme set is based on Roboto font headings with neutral colors, and Open Sans base text for better reading experience. An expanded set of headings styles, along with a special Quoted paragraph style, provides a number of options for attractive page designs. As well, Font Awesome – a font consisting entirely of icons – has been added to the theme. You can add these icons to a content gadget, and modify their color and size directly from the content editor. You can copy and paste icons from the Theme icons page, which appears as a sample page when you create a site using this theme, or switch to it. To keep the icons readily available, you might want to keep this page as an admin-only non-menu page. For more information, see Using Font Awesome icons. Large, rectangular button styles are available for link buttons. A new style has been added to the social profile icon styles, featuring a hand-drawn style and hover effects. From the Colors and styles screen, you can customize the colors, fonts, styles, and backgrounds of various elements that appear throughout your site. When customizing the colors and styles of Homestead themes, you can customize elements within each gadget. You can also customize Homestead themes using CSS and theme overrides.